Monarch Mountain doesn’t get a big marquis, but it offers some fine off-the-beaten-path Colorado skiing in the south west of this skiers state. Located in South Central Colorado, Monarch Mountain skis on 800 acres of terrain in the Sawatch Range on the Continental Divide. Monarch is the real deal for families. You park, walk to the base area, start and end your day at the central base lodge. Monarch is not about big real estate developments – its located in San Isabel National Forest, but it is all about un-crowded, un-commercialized skiing. Monarch is reputed for its abundant natural snow, over 350 inches annually, and friendly locals. On a powder day, you can expected run after run of first tracks at Monarch Mountain as they just don’t get many advanced skiers and there’s 130 acres of awesome terrain in the double black diamond extreme terrain of Mirkwood Bowl! There is even more extensive backcountry skiing in Mirkwood Basin via Monarch’s snowcat tours. Monarch Mountain Cat Skiing takes you to the backcountry of Mirkwood Basin for 1,200 acres of bowls skiing, steeps and glades. Monarch snow cat tours are like an all day ski limo for 12 skiers with two guides for under $300 a day, including morning safety protocol, cat rides and skiing, lunch at the base and more cat skiing in the afternoon. You can expect ten-12 runs of some of the best cat skiing in Colorado – bring your fat skis. For families with young kids and novice skiers and snowboarders, Monarch’s lower mountain, offers a unique covered magic carpet, and the Tumbelina Lift, then graduate to Breezeway and ski long Little Mo before conquering the Pioneer and Panorama lifts to 11,952’. 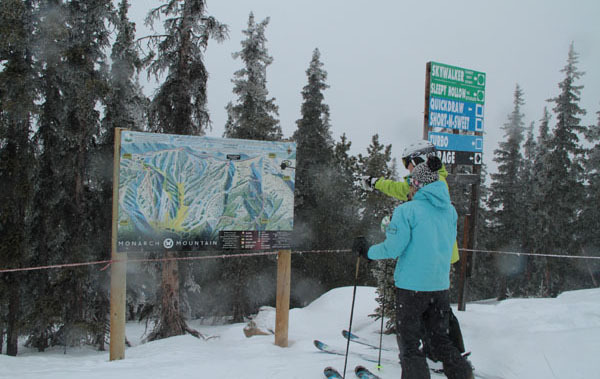 All Monarch’s lifts have blue or green runs for family ski fun. Kids might enjoy knowing that Monarch Mountain’s names is for the Monarch butterfly that migrates through this region form Mexico. Monarch hopes to expand off the backside, but being National Forest land this could take few years. Meanwhile ski from the Continental Divide into Southbound and Mirkwood Bowl for steep exciting terrain. Monarch has newly redesigned base lodge with a ski shop, full service cafeteria, and a sit down service at the Sidewinder Saloon. We recommend the Sidewinder nachos with a view of the slopes. Or visit the highest Starbucks in the world located in Monarch’s base lodge and facebook your friends that you are having a very tall latte! In a separate lodge you will find, childcare, kids lessons and rentals. Monarch dates back to 1939, and has remained affordable, friendly and frequently blessed with fresh dry, light snow. The newly expanded base lodge offers all the services your family will need, childcare, kids lessons and rentals. The town of Salida in the scenic Arkansas Valley has family friendly lodging for skiers ranging from motels, bed and breakfasts, as well as condos and cabins in the towns of Salida and Monarch. We recommend lodging at The Palace Hotel in downtown Salida, a very fun friendly Colorado river town with great shops, art galleries and restaurants.